My oldest has loved pirates for the last 2 years or so. His 4th birthday had a pirate theme, and he was *this* close to another pirate party this year, when he opted for super hero's instead. Even though he changed his mind on the party, he is a real pirate fan. When the opportunity came for me to review a copy of "My Very Own Pirate Tale" from I See Me books, I jumped at the chance. It arrived around the time of his birthday, so he was thrilled with another birthday gift. When you order the I See Me books, it gives you the chance to have a personalized message written to the child on the first page of the story. The story is done in rhyme, and they use the letters of the child's name (first and last) and each letter is associated with some sort of sea creature, and a picture of that creature. At the end of the book, there is a glossary from A-Z with the creatures that are used, and a little bit about them. Julien absolutely LOVED listening to me read the story - when he realized his name was in the book, he was so excited, but then confused.....but then excited again when I told him it was a special book JUST for him. I See Me has a number of different personalized books and other items to choose from. The pirate book came with a pirate bandanna that was also personalized for Julien, and there is also a place mat that matches as well. Until the end of August, you can use the code "MATEY" to receive 15% off any of the pirate items from the website. Don't forget to connect with them on twitter and facebook. I was sent the above product free of charge in exchange for a review; the opinion stated belongs to Tales of Mommyhood, your experience and opinion may vary. I love the I see Me books. We have 1 for each boy, and I would love more! very cool book! I have never read or heard of I see Me books. Oh wow, so cool! I hadn't heard of these books either. I'd love to get one for Keira. 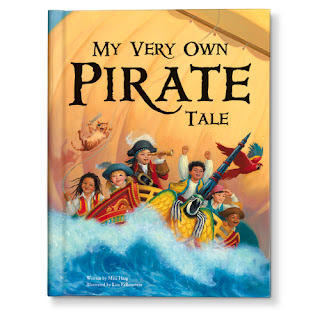 Cool book, Lucas is crazy for Pirates right now!! He loves the Playmobil guy outside of Tag Along Toys, lol! Thanks for the code too! I love these books and so does my son! My son just watched band of pirates dvd which I'm reviewing. He'd love this book, super cool!